When MC Rodney scribbled the Name Kingstone for the first time on a beer mat in his homeland of Sauerland in 1996 he could hardly imagine what broad repercussions this name would have in the world of reggae. 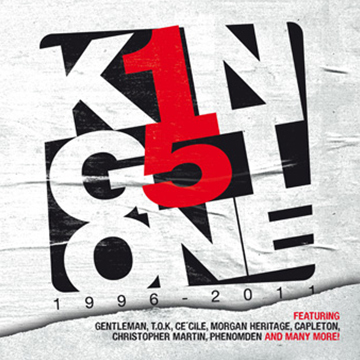 Therefore this album is dedicated to the thousands of party people who have been attending Kingstone’s weekly dance at the Studio 672 in Cologne, and to all the artists Kingstone has been working with over the years. Some names are closely connected to Kingstone in Europe, so it’s no wonder that on the album we can meet Ce’Cile with her latest Hit „Hey“ feat. Agent Sasco and T.O.K with their party smash hit „Runaway“, the conscious roots song „Love is a plus“ and the crazy Rock meets Dancehall tune „I Don’t Care“. With the „Liberation Time RMX“ from Capleton feat. NORE, Kingstone shows that hip hop beats are absolutely not new for them. This song was featured by Booba in France and can be found on his Streetalbum that nearly sold gold and was also featured by Azad in Germany. Besides the many international stars and starlets of the Carribean, local artists are represented on the album as well. Not only Cornadoor and the german-speaking rascal Ronny Trettman with his personal tribute to the bavarian Oktoberfest but also the cologne-based reggae-icon Gentleman and the swiss gold artist Phenomden. Some songs are premieres (Stacious, Double Up Crew, Christopher Martin, Denham Smith, G Whizz) and highly representable besides the well-tried hits. All songs come without exception from the hands of Kingstone’s cologne-based producers Ben Bazzazian (Gentleman, Azad, Bushido) and Kingstone’s Selecta Lazy Youth (Jens Peitzmeier) who performs a track on this album as well.